Smoking and life insurance are strange bedfellows. However, there are some companies that look at smoking in a much more favorable light than others. At TermLife2Go, we work with dozens of top rated best life insurance companies. We focus on the niches each company addresses and align our clients with the company that best fits our client’s needs, health and lifestyle. Give us a call today to see how we can best serve you. According to the most recent information found in a Google search, a little over 18% of the population of the United States are cigarette smokers (actually, the info comes from the Center for Disease Control). That means that 42 million people are cigarette smokers and I assume cigar and pipe smokers. What that does not reflect is the millions of nicotine users that prefer to use chewing tobacco or electronic cigarettes. On top of that is the nicotine gum or patch users. So there is probably close to 50 million people in the United States alone that use some form of nicotine product. That is a huge opportunity for a tobacco or nicotine friendly life insurance company that fills this huge niche in the life insurance marketplace. Or said another way, there is a lot of money in smoking and life insurance. And filling that niche is ultimately what matters most. The key for consumers is knowing which life insurance company is currently offering the cheapest life insurance for tobacco users. And when it comes to smoking and life insurance, what one company considers a smoker is very different than what another company does. That is why it is crucial to seek out an agency like TermLife2Go who stays on the cutting edge of life insurance company niches and can place you with the best company at the best price. Who is considered a smoker for life insurance? 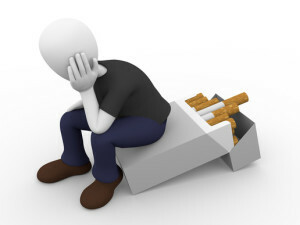 On virtually every application that we see the common question regarding nicotine use is “have you used tobacco or nicotine in the last 12 months?” If you answer yes, then you are a smoker. Even 1 cigarette at a nightclub 6 months ago would be considered tobacco use for life insurance (by most companies). When some of us at TermLife2Go were captive agents for larger call center type agencies (think SelectQuote or AIG Diect), we would have a client who would go through the entire application with us, only to get to that question and have them say “Well, yes, but only once a month when I go out drinking.” And just like that, we had to quote a smoker premium that was 2-4 times higher than the premium we had originally quoted. Most people do not realize that just one cigarette in the last year would place them into a “smoker” category for life insurance purposes. The good news is there are companies out there that do not have such rigid guidelines on what constitutes a smoker and a non smoker. In the example above, that same casual smoker who only smokes an occasional cigarette once a month when out drinking with friends could qualify for a preferred rate class with a specific carrier. The difference between the two premiums is substantial (we are talking hundreds if not thousands of dollars a year in savings). The sad truth is, a lot of the bigger agencies cannot write with this specific company so they won’t even let you know a cheaper alternative exists. What is considered smoking for life insurance? Obviously cigarette smokers are considered smokers for life insurance. However, so are people who use chewing tobacco, cigars, pipes, electronic cigarettes, and even nicotine patch users and nicotine gum. Yep, even nicotine gum. That is because the test that determines if there is nicotine in someone’s urine cannot determine where the nicotine came from. Therefore, if you pop positive for tobacco on a life insurance medical exam for having cotinine (an anagram of nicotine and the substance life insurance underwriters look for) it does not matter what the source, even nicotine gum. For more, see Exploring what life insurance medical exams test for. Cigar users, even daily, can qualify for a non tobacco rate class. The same goes for chewing tobacco users, pipe smokers, and electronic cigarette users. And cigar users, who use sparingly, (only once a week), can qualify for a preferred plus rate class. That means you could theoretically smoke one cigar a week or 52 total cigars in a year, and still qualify for a specific company’s top rate class. Should I lie on my life insurance application about my tobacco use? But how would the company ever find out? A few ideas come to mind. One would be to simply investigate your spending habits over the last couple of years—if you purchased a tobacco product than that would be a serious red flag. Another way is by looking at your medical files. Your primary care physician probably checked the box marked “smoker”. Another common way insurance companies nail prospective clients is through the medical information bureau, or MIB. Clients apply with one carrier and receive a tobacco rate. So they decline the coverage and re-apply with another company. Unfortunately for them, their information is shared with every life insurance company out there via the medical information bureau. What if I recently quit smoking? Many people wonder how long they have to quit smoking to qualify for life insurance without a tobacco rating. There are a lot of life insurance niches available for those who have quit the habit. Specific companies will offer a preferred plus rate class if it has been at least three (3) years since your last tobacco use. Some companies will offer a preferred rate after only one (1) year of no tobacco use. Once again, it pays to know which company is the right fit for you and your specific scenario. We currently represent dozens of the top rated life insurance carriers. Give us a call today and see how much we can save you on life insurance for smokers. Thank you for reading Smoking and Life Insurance: Find the Best Rates. Please leave any questions or comments below.